If you haven’t heard, The Sims Team announced a brand new career coming to The Sims 4 in a free content update and it looks like it’s going to be one of the most exciting careers we’ve seen yet! The announcement came during the latest Maxis Monthly livestream, hosted this month by SimGuruGraham and SimGuruChowder. 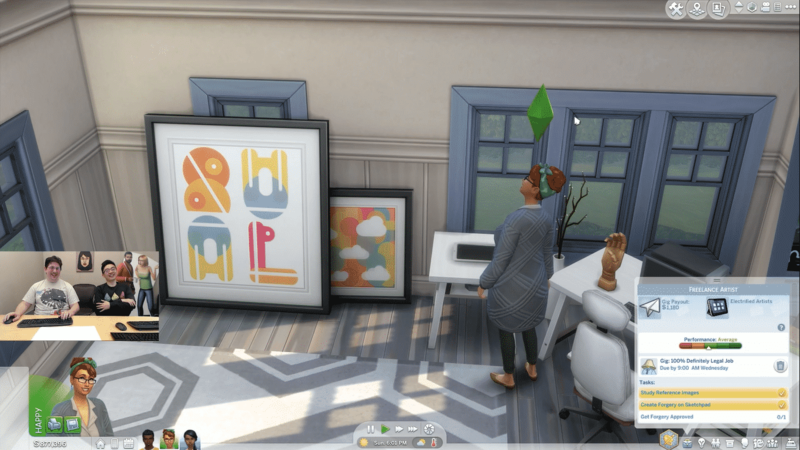 As well as a range of new clothes and goodies that SimGuruChowder described as “home office chic,” the next free content update for The Sims 4 will include the new Freelancer career. The Freelancer career is a brand new type of career all together. This means that it is not a rabbithole career, a work from home career, or a fully active career. 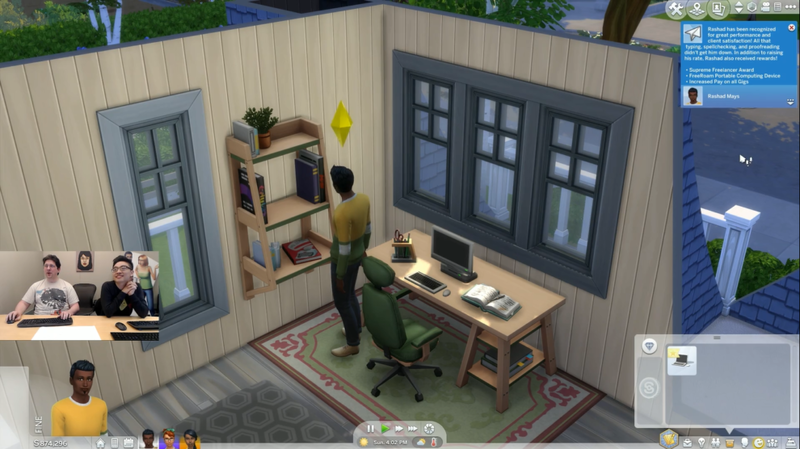 SimGuruGraham described the Freelancer career as a mashup of all the different types of careers we’ve seen previously. Like the work from home careers, the Freelancer career will have flexible working hours and will not require your Sim to go off the lot to a rabbithole destination. 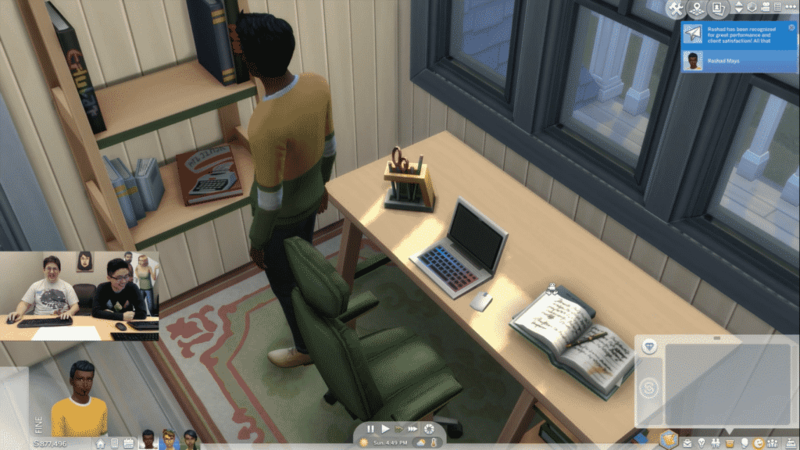 Your Sim will be able to work on their own schedule. The Freelancer career will also incorporate elements of the Acting career from the Get Famous expansion pack. 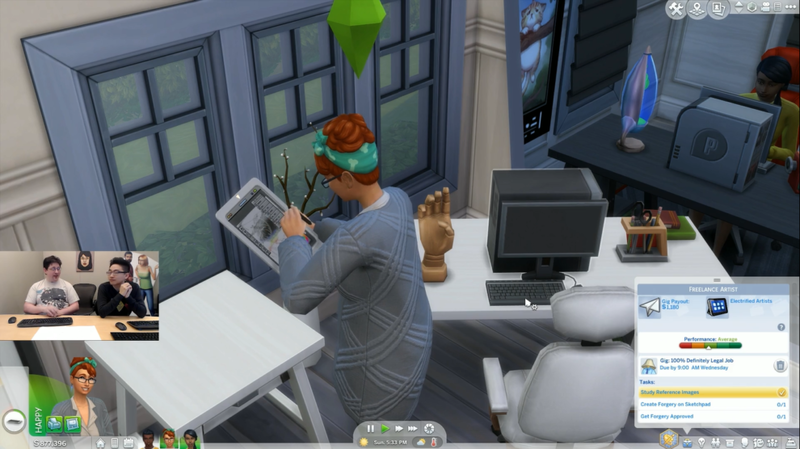 Your Sim will join an agency and pick and choose the gigs they’d like to work on. Sims in the Freelancer career will have three branches to choose from instead of the standard two from past careers. Your Sims can be a freelance programmer, a freelance artist, or a freelance writer. Freelance programmers and freelance writers do their work on the computer. Freelance artists use the computer as well, but they also make use of the digital sketch pad that came with the Style Influencer career in a past update. SimGuruGraham mentioned in the stream that the Freelancer career was designed to allow for more trades to be added in the future, but stressed that this does not mean more trades are definitely coming to the game. It’s just a possibility. When your Sim joins a freelance agency and starts looking for gigs, the available gigs will be tailored towards your Sim’s skill level. Freelance programmers will need to build the Programming skill. Freelance artists will need to build the Painting skill. Freelance writers will need to build the Writing skill. Increase your Sim’s skill level in order to see more gigs and better paying gigs. The gigs change every day, so your Sim will not be stuck doing the same gigs over and over again all the time. When your freelancer Sim completes a gig, they will be able to send it to the client for review. Each gig has multiple outcomes with a small story aspect depending on the quality of the work your Sim did. The project might be accepted by the client, providing your Sim with boosted job performance and simoleons. The client may also reject a submitted project if it doesn’t meet their quality standards. When this happens, your Sim will need to edit the project and resubmit it for review. Instead of promotions, freelancer Sims can be “overmaxed” in their career. This means that every time they fill up their job performance bar, they will earn more money for all future jobs done with their current agency. Overmaxing the Freelancer career can unlock some brand new career reward objects that will also be included in this update. Players who were disappointed that laptops were exclusive to the StrangerVille game pack will be delighted to know that a new chroma key laptop will be included in this free update as a career reward object! That’s everything we know so far about the upcoming Freelancer career for The Sims 4! 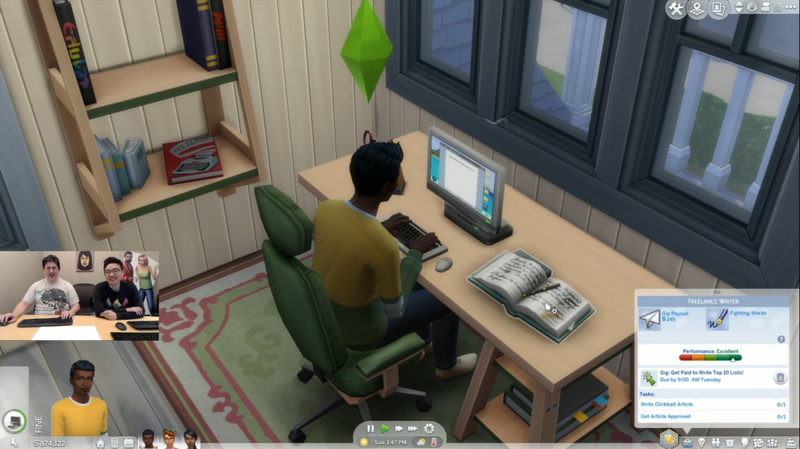 Will your Sims be diving into the exciting world of freelancing? Let us know in the comments or chat with us on social media! The Freelancer career will be coming to The Sims 4 in the next free content update on April 16th, 2019! I like when they build a system and it gets used in other parts of the game or built up on (free and paid) like the club system, work at home (city living) or the point system (vampires). I also like that we’re getting more careers that aren’t required to be rabbit holes so it allows more flexibility. They should call the sims fashions what they are, frumpy. I wish they would hire a fashion guru. Honestly? We need frumpy, too. Not everyone looks like they’ve just walked the runway, and it would be really weird if all the clothes available to us were fashionable. Personally, I find the inclusion of “frumpy” clothes very refreshing. It makes my sims seem like real people. And as someone who has family who works from home? Trust me, no one’s wearing an Italian blazer, $80 skinny jeans, and Stilletos. It’s a good day when everyone’s wearing pants at all. @grace b i agree the sims team have to make sure they are working on content to run on multiple systems and it can be hard. try cc (custom content) it adds so much new fashion to your game! Try custom content it will change your life! my laptop isnt that good and i was terrified to download it incase i got a virus or something… now i have mods/cc and loads more!! @MRS C try custom content. the sims team need to work on content to support all platforms so its hard to make detailed clothes. I would LOVE old, dirty sweatpants! The Sims franchise as a whole has had a tendency to skew towards glamorous. Which is great if you’re playing as a rich, fashionable person; not so great if you aren’t. I play with rural-style sims a lot, as well as very down-to-earth types, so this sort of stuff is just great. I want clothes that make my sim look like they’ve just finished helping a friend move, clothes that make them look like they just finished weeding the garden or mowing the lawn, clothes that make them look like they’re out there living their lives. 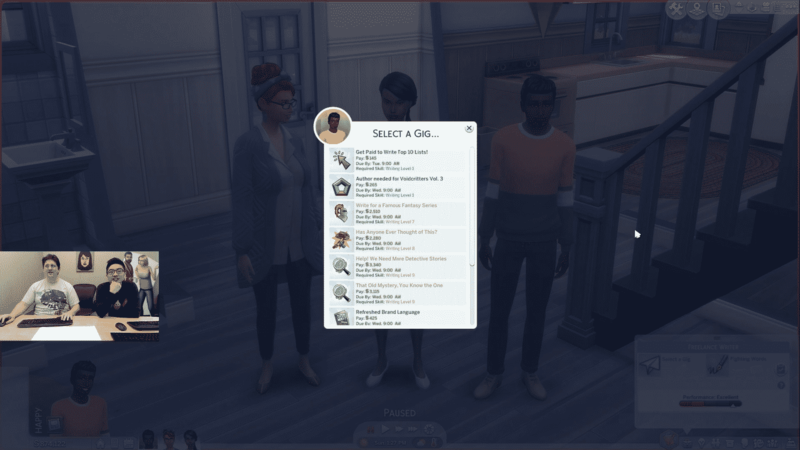 And that’s just me; there are also people who play through the Homeless Challenge (or other related challenges), who want to play as unemployed sims, who want to play as various other things. Giving us a wide range of clothing types — including frumpy! — gives us those options. Also? And as someone who has family who works from home? Trust me, no one’s wearing an Italian blazer, $80 skinny jeans, and Stilletos. It’s a good day when everyone’s wearing pants at all. yes!! this style is totally chilled and the sims team are all working there hardest for this update. This looks amazing – is it going to consoles as well? @Kellstronics Unfortunately console will not be getting this update yet, they are getting. Bugs fixed. and mouse features so go check that out!! Hi! I was just wondering if the freelancer career would work for the 100 baby challenge?